"How did you learn programming? ", a student asked me in a recent summer camp. Dr. Yaohang Li organized the Machine Learning and Data Science Summer Camp for High School students of the Hampton Roads metropolitan region at the Department of Computer Science, Old Dominion University from June 25 to July 9, 2018. The camp was funded by the Virginia Space Grant Consortium. More than 30 students participated in it. They were introduced to a variety of topics such as Data Structures, Statistics, Python, R, Machine Learning, Game Programming, Public Datasets, Web Archiving, and Docker etc. in the form of discussions, hands-on labs, and lectures by professors and graduate students. I was invited to give a lecture about my research and Docker. At the end of my talk I solicited questions and distributed Docker swag. The question "How did you learn programming?" 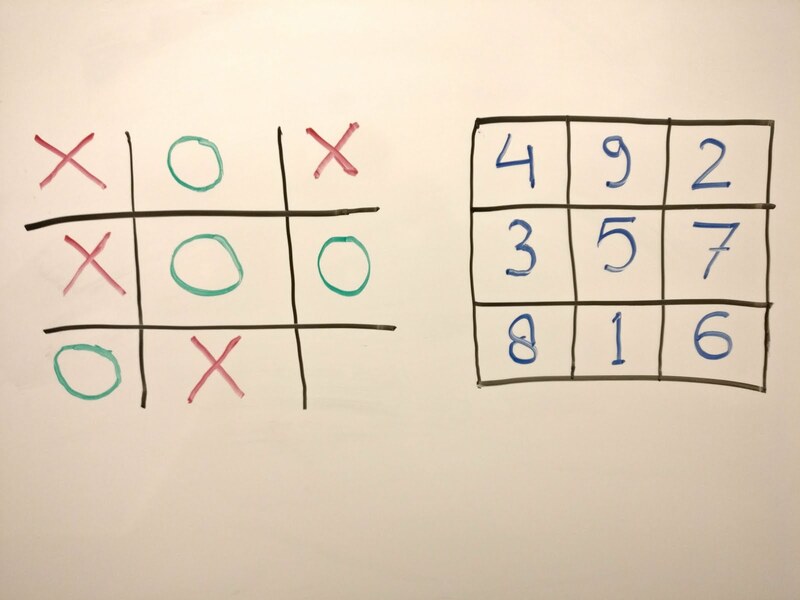 led me to draw Tic-Tac-Toe Game and a 3x3 Magic Square on the white board. Then I told them a more than a decade old story of the early days of my bachelors degree when I had recently got my very first computer. 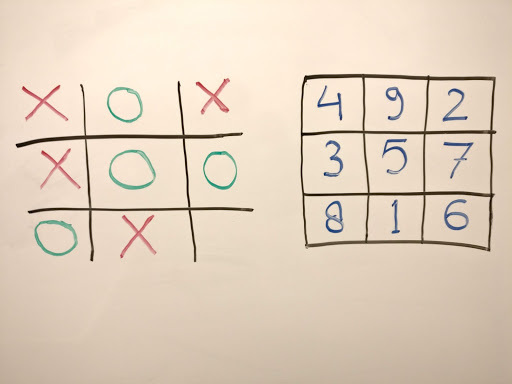 One day while brainstorming on random ideas, I realized the striking similarity between the winning criteria of a Tic-Tac-Toe game and sums of 15 using three numbers of a 3x3 Magic Square that uses unique numbers from one to nine. The similarity has to do with their three rows, three columns, and two diagonals. After confirming that there are only eight combinations of selecting three unique numbers from one to nine whose sum is 15, I was sure that those are all placed at strategic locations in a magic square and there is no other possibility left for another such combination. If we assign values to each block of the Tic-Tac-Toe game according the Magic Square and store list of values acquired by the two players, we can decide potential winning moves in the next step by trying various combinations of two acquired vales of a player and subtracting it from 15. For example, if places 4 and 3 are acquired by the red (cross sign) player then a potential winning move would be place 8 (15-4-3=8). With this basic idea of checking potential wining move, when the computer is playing against a human, I could set strategies of first checking for the possibility of winning moves by the computer and if none are available then check for the possibility of the next winning moves by the human player and block them. While there are many other approaches to solve this problem, my idea was sufficient to get me excited and try to write a program for it. By that time I only had the basic understanding of programming constructs such as variables, conditions, loops, and functions in C programming language as part of the introductory Computer Science curriculum. While C is a great language for many reasons, it was not an exciting language for me as a beginner. If I were to write Tic-Tac-Toe game in C, I would have ended up writing something that would have a text-based user interface in the terminal which is not what I was looking for. I asked someone about the possibility of writing software with a graphical user interface (GUI) and he suggested that I try Visual Basic. So I went to the library, got a book on VB6, and studied it for about a week. Now, I was ready to create a small window with nine buttons arranged in a 3x3 grid. When these buttons would be clicked, a colored label (a circle or a cross) would be placed and a callback function would be called with an argument associated with the value according to the position of the button (as per the Magic Square arrangement). The callback function can then update states and play the next move. Later, the game was improved with different modes and settings. One day, I shared my program and approach with a professor (who is working for Microsoft now) with excitement. He said this technique is explored in an algorithm book too. This made me feel a little underwhelmed because I was not the first one who came up with this idea. However, I was equally happy that I discovered it independently and the fact that it was validated by some smart people already. This was not the only event when I had an idea and needed the right tool to express it. Over time my curiosity lead me to many more challenges, ideas of potential solutions for the problem, and exploration of numerous suitable tools, techniques, and programming languages. My talk was scheduled for Wednesday, June 27, 2018. 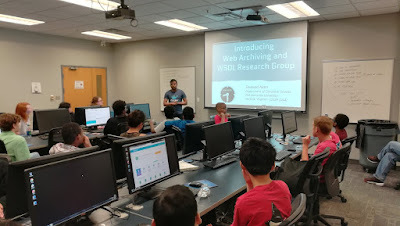 I started by introducing myself, WS-DL Research Group, basics of Web Archiving, and then briefly talked about my Archive Profiling research. Without going too much into the technical details, I tried to explain the need of Memento Routing and how Archive Profiles can help to achieve this. Luckily, Dr. Michele Weigle had already introduced Web Archiving to them the day before my talk. When I started mentioning Web Archives, they knew what I was talking about. This helped me cut my talk down and save some time to talk about other things and the Q/A session. I then put my Docker Campus Ambassador hat on and started with the Dockerizing ArchiveSpark story. Then I briefly described what Docker is, where can it be useful, and how it works. I walked them through a code example to illustrate the procedure of working with Docker. As expected, it was their first encounter with Docker and many of them had no experience with Linux operating system either, so I tried to keep things as simple as possible. I had a lot of stickers and some leftover T-shirts from my previous Docker event, so I gave them to those who asked any questions. 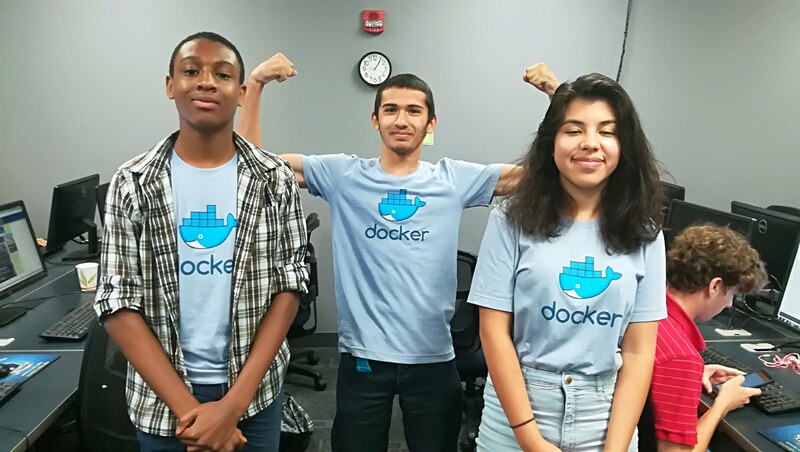 A couple days later, Dr. Li told me that the students were very excited about Docker and especially those T-shirts, so I decided to give a few more of those away. For that, I asked them a few questions related to my earlier talk and whoever was able to recall the answers got a T-shirt. Overall, I think it was a successful summer camp. 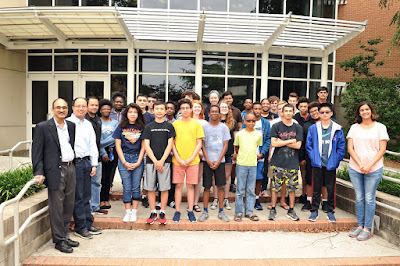 I am positive that those High School students had a great learning experience and exposure to some research techniques that can be helpful in their career and some of them might be encouraged to go for a graduation degree one day. Being a research university, ODU is enriched with many talented graduate students with a variety of expertise and experiences which can benefit the community at large. I think more such programs should be organized in the Department of Computer Science and various other departments of the university. It was a fun experience for me as I interacted with High School students here in the USA for the first time. They were all energetic, excited, and engaging. Good luck to all who were part of this two weeks long event. And now you know, how I learned programming! Amazing!! & Nostalgic too for me..